Small in size yet bold in realistic color, this set of miniature artificial succulents brings maintenance-free plant color to reception desks, bookshelves, coffee tables or other small spaces in need of light decor. Set in sphere-shaped, bright white ceramic planters for a contemporary look to complement a variety of environments, these cute little desert plants are ideal for office, restaurant, or retail decor, and being synthetic, they require no upkeep other than occasional dusting. Place individually or as a set in any small space in need of a vibrant color and lifelike plant beauty. 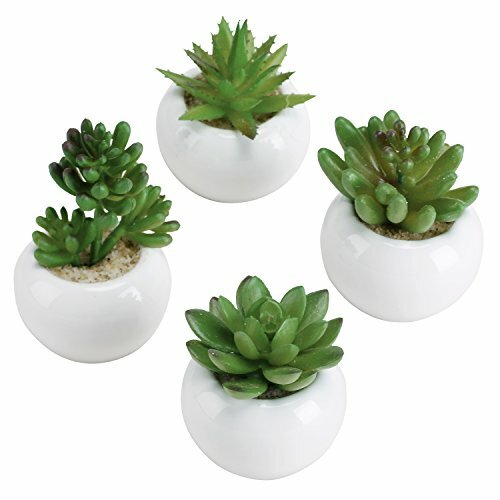 Approximate Dimensions (in inches): Tallest Plant - 3.1 H × 2.6 D; Pot only - 1.65 H x 2.56 D.
Set of 4 artificial miniature succulent plants in sphere-shaped white ceramic pots. 3-inch tall size allows for decorative use in small areas such as desktops, restaurant tables, bookshelves, and windowsills. Simple spherical white ceramic planters offer optimal decorative versatility for a variety of settings. Artificial plants require no watering or sunlight.